2. Click the button labeled Address Book found at the top on the right side. 3. The Address Book window will open up. You can search for people using the search bar. The Address Book can be managed by using the two sorting options, Search All Fields and All Folders. 4. For the Search All Fields option, the other option available is Search Names Only. For the All Folders sorting options, sorting by individual folders are also available. 5. When you have finished your sorting options, type the desired word or phrase into the search bar to see if it is in the Address Book. 6. To create a new contact for the Address Book, click the People icon found at the bottom left corner of the page. 7. Highlight the Address Book on the left side of the window and click New Contract. Fill out the necessary information and click Save and Close. The contact will appear in the Address Book. 8. 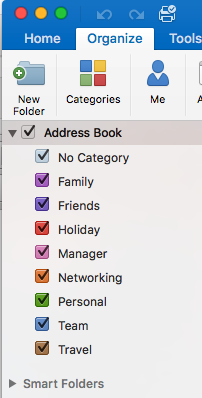 To add a new folder to the Address Book, click the Organize tab. 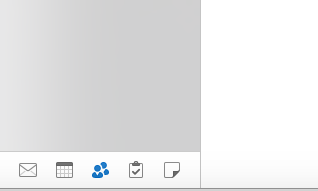 At the top right of the window, click the New Folder button. 9. The folder will appear in the Address Book bar. Give the folder a name and hit Enter to create the folder.